And the hard part is that there is still a lot of IMPORTANT stuff left to do like finals, playoffs, end of year parties, and graduation! Maybe that is why I am so ready for Summer! My sister-in-law sent me a text asking for ideas for a healthy snack for the end of the year class party. I told her to bring a 10 pound bag of apples. But in case you are looking for something a little cuter (but still on the easy enough to pull off the last day of school side, here are some cute ones that won't break the bank or your will to live. My first choice would be these cute butterfly bags from Squawk Fox. You can fill them with anything and if you let your kids decorate the clothes pins they are relatively easy. (I would even leave off the cute eyes as a last minute sanity saver. She has a great tutorial on her site on how to put them together. 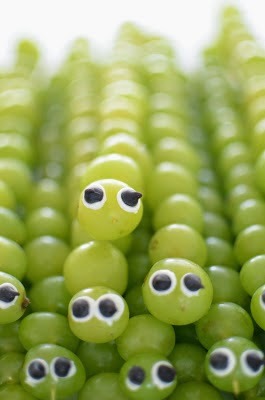 Maybe a tie for first are these cute caterpillar grape kabobs from The Princess and The Frog. 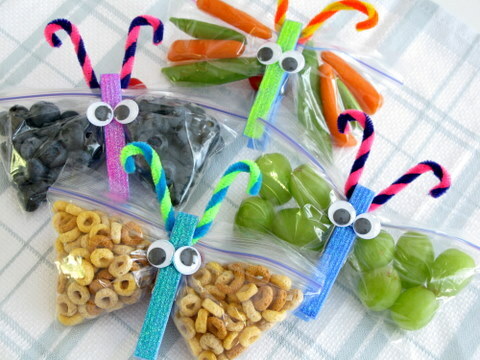 As long as your kiddos are old enough to be trusted with a skewer, these cute snacks are easy to put together and easy to hand out during the party. 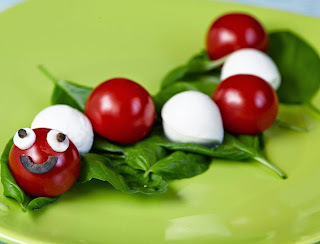 If the kids are a little older and you want to try something other than fruit, you could use the same caterpillar kabob concept, but with tomatoes and mozzarella balls, just like a caprese salad. Sort of like this hungry caterpillar, just add the skewer. I would probably leave off the smile and maybe use something like cloves for the eyes. I love these cute bananas wearing party hats. Sometimes it isn't the snack as much as the presentation. 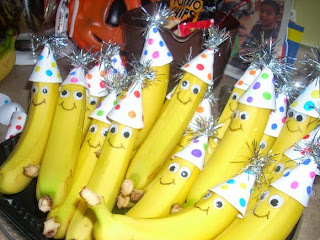 There is a mini party hat tutorial over at Lavender's Blue that you can use for the banana hats. 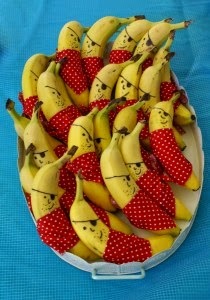 While looking for the bananas with party hats I stumbled upon these adorable banana pirates from grubby Little Faces. It doesn't even matter if your class party has a pirate theme, I am pretty sure you could get away with bringing these cute things! If all else fails, you could just put apples in a cute basket at the last minute too! I am pretty sure the kids will be so excited for summer they won't know the difference.